Before you begin throwing things at your screen and harassing me on the internet, please understand one thing: picking these teams is BRUTAL. The overall talent level of the league is so high, the margins between guys are so thin, and the criteria for selection are so nebulous. Harden and Giannis should undoubtedly be first team, but beyond that, I could be convinced of almost anything else, especially on the third team. For all the "death of the big man" talk which has gone around over the last few years, choosing only three centers is incredibly difficult. I can't find my way to leaving off two dudes putting up prime Shaq numbers (Embiid and Davis, a coin flip for first vs. second team) or the best player on the best team in the West (Jokic), and thus deserving guys like Rudy Gobert, Nikola Vucevic, Marc Gasol, Karl-Anthony Towns, and Clint Capela all get squeezed out. Beyond Giannis, the forward spots are more or less interchangeable. Kahwi, LeBron, KD, and PG all have a strong case for making the top unit. If you wanted to leave Blake off and move DeRozan to his spot, thus opening up another guard spot for someone like Kyle Lowry, Victor Oladipo, Ben Simmons, or Russell Westbrook, I wouldn't take issue with it either. Just more evidence of how many legit candidates there are for these spots. We can have all these different arguments without even mentioning guys who will get All-Star consideration such as Mike Conley, Khris Middleton, Jimmy Butler, Bradley Beal, Klay Thompson, Steven Adams, Jusuf Nurkic, Tobias Harris, Danilo Gallinari, LaMarcus Aldridge, Luka Doncic (hold that thought), and Devin Booker. The Association is freaking STACKED with stars right now. I feel a little better about the guards. Curry has missed a bunch of games, but he's been unbelievable when he's played, combined with no one else who has quite approached his per-game production while also being more durable, so Steph gets the nod. If we didn't have to build these teams with some semblance of positional designations in mind, the makeup of the individual teams would look quite different, but I'm fairly confident I have something like the correct fifteen guys. Let's move on before I reconsider. Yeah, I know, it appears I've already changed my mind from just a few weeks ago, but hear me out. My previous pick, Julius Randle, has now started more games than he's come off the bench, and with a trade of either him or fellow PF Nikola Mirotic looking increasingly likely prior to the trade deadline, I see little chance he'll remain eligible for the award at season's end. In any case, Sabonis is a more-than-deserving winner, for all the reasons I discussed back in December. His per-36 numbers remain monstrous (21.4/ 13.7/ 4.2) with a righteous 62.2 FG% and terrific defense, giving him a solid case for both this award and Most Improved Player. Since there are more players I want to discuss, he'll have to settle for 6MOY on my fake ballot. Speaking of, this is perhaps the most difficult award because the criteria voters choose to weigh when considering the idea of "most improved" are rather subjective and context-dependent. Sometimes, the winner ends up being a second-year player who outstrips his expected developmental trajectory and combines it with additional minutes and usage, giving the statistical appearance of a massive leap in production. The question is whether we should reward this type of improvement with the award, or basically just say, "Good job becoming what you're supposed to become. Keep it up." In this case, I'm referring to De'Aaron Fox, who in the absolute sense, is the "most improved" player in the NBA. I am bullish on his future, but how do we properly triangulate his "improvement" relative to how poor his rookie season was and how high our expectations are for such a highly-pedigreed player? Good things are coming his way, no doubt, but I personally don't see him as the type of player "meant" to receive this award, whatever that means. The other archetype for the award is the solid veteran who unexpectedly goes from "good" to "great" in a given season, with Vucevic being our avatar this year. 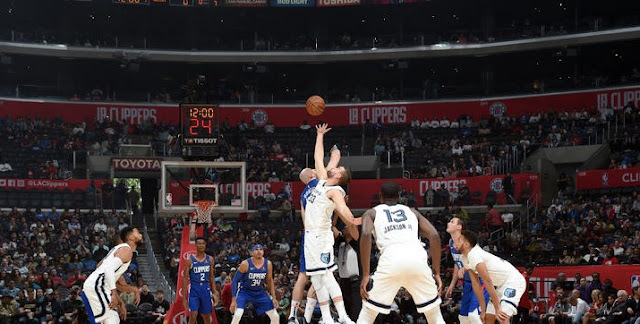 Vooch has improved in a real sense, averaging career highs in points, rebounds, assists, and usage, while stretching his game out to the 3-point line (38% from deep on 3.1 attempts per game) in accordance with modern NBA big man orthodoxy. If Orlando's front office is smart -- an 'if' so big you can see it from space -- Vucevic should get traded before the deadline in a few weeks, but that is more a testament to his contractual situation and Orlando's continued inability to field a competitive team than his play. He's been fantastic and should absolutely be a first-time All-Star, but he's also been an under-the-radar excellent player throughout much of his career, which unfortunately hurts him a bit when it comes to this award. I'll split the difference and give it to Siakam, who has been a revelation for the East-leading Raptors. 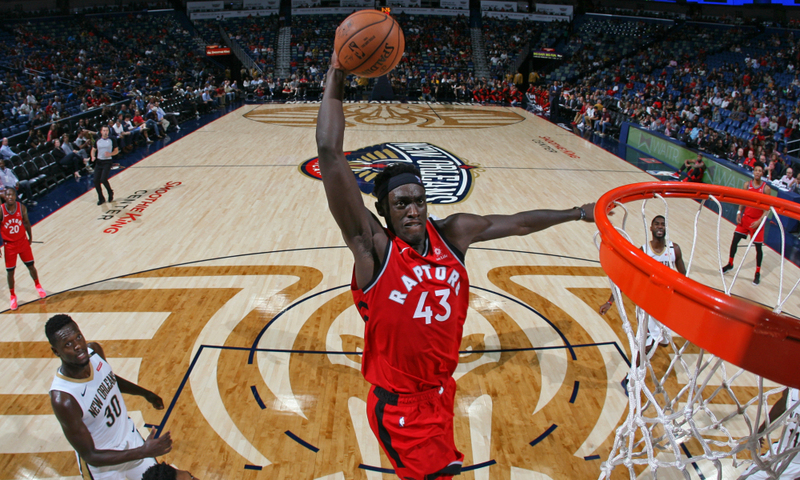 Now in his third season, Siakam came into the league as something of an oddity, starting 38 games his rookie year for a 51-win Raptors team after being drafted 27th overall out of New Mexico State in 2016. I remember watching some of their games that year and thinking, "Wait, who is this guy, and why on Earth is he starting?" Then he would show flashes of the player he would become, and I realized the answer to my question was because he was freaking everywhere on the court. He was an unrefined mess at that point (hence why he got drafted 27th), but it was easy enough to see the building blocks of a really useful player. Fast-forward two years, and we are seeing that player emerge on a consistent basis. Siakam has gone from a guy who just runs around like his hair is on fire to a guy who runs around like his hair is on fire but with skill and purpose. It's weird and a little unfair to compare anyone to Draymond Green, but Siakam functions as something like Toronto's analogue to 2015 Dray: an immensely mobile big who is a beast in transition, scores around the hoop, makes the right decisions, seems to get every loose ball, and hits just enough shots from the outside to command attention. He is sturdier than he looks but also has quick feet, making him tremendously versatile on defense. 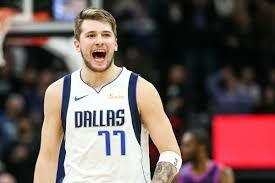 He never gets a play run for him, but much like Sabonis, is always around the ball and influencing the action in a positive way. Siakam has become an integral part of Toronto's core, averaging 30.9 minutes a night (third on the team), producing 15.2 ppg/ 6.9 rpg/ 2.8 apg on 57/33/78 shooting, and filling in every crack for a team on a 60-win pace. From a guy no one had heard of (and 26 teams didn't want) two years ago to the third-best player on a potential Finals team? Now that is some improvement I can get behind. I don't particularly like this award because rather than reward the coach who actually "performed" the best, it tends to just go to the coach of whichever team outperformed expectations to the greatest extent. While there is certainly a correlation between the two things, they are not the same, but we use the latter as a shorthand for the former because it's much easier to quantify. It's a team award masquerading as an individual award, and while the coach deserves a fair share of the credit when his team exceeds preseason expectations, it still feels like an oversimplification. If we were truly trying to honor the "best" coach, the award would just be renamed after Popovich and handed out to him annually at season's end. His consistent excellence makes it difficult for any individual coaching job he does to stand out from the others, leading to him often being overlooked by voters in favor of a newer, shinier object. [Obviously, I'm about to be guilty of this as well.] Doc Rivers has done a nice job pivoting from the star-laden Lob City rosters to the more egalitarian style of this year's deep Clippers team. It's unclear to what extent, if any, removing his personnel responsibilities has made him more focused and effective as a coach, but he has to get credit for how hard he has this band of misfits and castoffs playing, as well as for going against type by giving rookie Shai Gilgeous-Alexander extended minutes to acclimate to the NBA game. Bucks' head man Mike Budenholzer deserves some shine for the improved defense and hyper-modern, five-out offensive scheme he's brought to Milwaukee to surround MVP candidate Giannis Antetokounmpo. The question becomes: is Coach Bud really this phenomenal, or does basic competence just appear spectacular vis-a-vis the Kidd/Prunty turd sandwich Bucks' fans endured last year? I personally think he's done a terrific job in extrapolating out the modern offensive game to its logical conclusion in support of his generational superstar, and would be perfectly okay with him winning the award. My suspicion, however, is the voting public is still harboring some (perhaps undeserved) skepticism about whether or not the Bucks are for real, which will hurt his case. Speaking of basic competence being a vast improvement -- ladies and gentlemen, the Sacramento Kings! After slogging his way through the back end of the Grit 'n' Grind era in Memphis, Dave Joerger has proven his adaptability by embracing an uptempo, spread-out style more befitting of the young, fast, athletic roster he has in Sacramento. Preaching pace while handing the keys to the offense over to second-year speed demon De'Aaron Fox was a bolder move in preseason than it seems now since we have proof-of-concept. Inserting veteran stretch-4 Nemanja Bjelica into the starting lineup to better space the floor around Fox was an inspired choice, particularly since there may have been organizational pressure to hand a larger role to no. 2 overall pick Marvin Bagley III right out of the gate. Improvements from Fox and backcourt mate Buddy Hield were likely to lift the Kings out of the West basement in any case, but credit to Joerger for persisting through organizational dysfunction and pushing the right buttons. With that said, the award has to go to Denver's Mike Malone. After barely missing out on the postseason last year, most folks around the league predicted the Nuggets would be a playoff outfit this season, but I doubt anyone saw them as a threat to secure homecourt in the West, where they had resided for much of the year prior to absorbing a beat-down at the hands of the possibly-switch-flipping Warriors on Tuesday night. Malone clearly has the benefit of a deep, talented team, but many of the core pieces are young and unproven, and the team's depth has been repeatedly tested by a litany of early-season injuries. Denver's perennially sieve-like defense has turned stout (10th in Defensive Rating), even with defensive anchor Paul Millsap missing eight games. Malone has found lineup combinations that work amid the injuries, cobbling together an elite bench unit featuring unheralded players Monte Morris, Juancho Hernangomez, Torrey Craig, and Malik Beasley. At 29-14 in the brutal West, no one has exceeded expectations quite like the Nuggets, so Malone could win on the usual dumb criteria alone. But the way he has mixed and matched lineups, built an effective defense around a ground-bound, lumbering center, and lifted up his young talent suggests a coach who has done a lot more than just benefit from an overachieving roster. Big men tend to get the benefit of the doubt in DPOY voting, and with good reason. Even with the migration of the game to the perimeter, there generally remains no more impactful defender than the disruptive back-line menace. Reigning DPOY Gobert, as well as Embiid and Turner, all fit the bill as defensive anchors who captain high-end outfits and turn the paint into a no-fly zone, but this award simply has to go to George. When the Zombie Sonics lost ace defensive wing Andre Roberson to a knee injury prior to the season, there was speculation PG might not be able to handle the heavy burden of being both a top offensive option (alongside Russell Westbrook) and a primary wing defender. The speculation could not have been more wrong. George has been an absolute killer on both ends this season, averaging career-highs in scoring and rebounding while locking down the perimeter for the team which has spent most of the year with the league's top-rated defense. [Note: they dropped to 3rd in D-Rating after giving up a baffling 142 points to Atlanta at home last night. It was a strange night in the Association overall.] He averages 2.3 steals per game (2nd in the league behind Westbrook, who has his own case for the award), sports a 102 individual Defensive Rating (elite for a primary wing defender in today's league), and NBA.com's "Hustle Stats" page might as well have a sub-heading which reads "Or, here's why Paul George is so freaking good." From an "eye test" standpoint, he seems to get his hands on the ball all the time, an assessment with which, again, the stats shake hands. He has reached the rarefied defensive air Kawhi achieved back in 2015, where he appears to be "mirroring" the movements of his matchup, essentially neutralizing every move as it's happening. His size and quickness allow him to switch comfortably across almost any matchup, a trait he shares with ascending teammate Jerami Grant. And yes, PG certainly benefits from having another defensive skeleton key out there like Grant, along with a resurgent Westbrook and a back-line stopper in my beloved Dothraki son Steven Adams. But his defensive dominance goes beyond what stats can capture (which is still a lot, even in our current data-driven world), and if any perimeter player is going to be rewarded, it should be George. Honorable Mention: DeAndre Ayton, Jaren Jackson, Jr. The easiest call on the board. Jackson looks like a can't-miss star, and Ayton will be the next Patrick Ewing if he can ever get his motor to rev above second gear, but with all due respect, this is a rout. Doncic is already the lead creator for a team hanging around playoff contention, he's a bona fide crunch-time assassin, and his per-game averages (20.2/ 6.7/ 5.0) for a rookie have been matched or exceeded in NBA history by Oscar Robertson, and...that's it. I could talk about Luka all day, but you get the point. We may be witnessing the genesis of an all-time great, so let's just enjoy it before everyone finds some dumb reason to turn on him. There are a number of guys with a tremendously strong case for the top award this year. As I said, the league is in a REALLY good place right now. Even so, it's effectively a two-man race between The Greek Freak and The Beard, and I'm sticking with my preseason pick, despite the historic offensive barrage Harden has put on of late. From a statistical standpoint, there's no way to deny what Harden is doing right now is on another freaking planet. His narrative is also strong (dude putting up unprecedented numbers to single-handedly will his team to the playoffs), but he suffers from having already won last year, as well as the way his style turns some voters off. The deciding factor in the race is going to be team success. As I wrote about in my preseason column, Russell Westbrook (and the resulting buyer's remorse) aside, the bar for championship contention and MVP contention tend to go hand-in-hand. So in all likelihood, an MVP candidate needs to rack up 54-55 wins to get over the top. Houston is on a 48-win pace, and would have to win 30 of its remaining 39 games to crack 55 wins. Not impossible, given what they've accomplished of late, but they will now be without star center Clint Capela for the next 4-6 weeks due to a thumb injury (in addition to the continued absence of Chris Paul). If Harden can keep the team humming without Capela and position the Rockets for some kind of homecourt in the playoffs, then I'll have to tip my cap and congratulate him on his second consecutive trophy. I hope he sounds like less of a drunken weirdo when he accepts the award this time. Milwaukee, by contrast, is 31-12, on pace for 59 wins. They face an easier schedule overall (due to the imbalanced schedule and the weakness of the bottom of the Eastern Conference), and their depth, style, and underlying stats all make 59 feel like an eminently reasonable goal. A 24-15 close to the season would get them to the magical 55-win threshold, even as it would represent a disappointment based on how they've played up to this point. "Best player, best team" is an overly simple heuristic for MVP voting, but it drives a lot of real world behavior, and Giannis has a much clearer path to the distinction than does Harden. Fair or not, each team's success this year will also be judged relative to its performance last year. Houston is likely to drop 10+ wins from '17-'18, while Milwaukee is likely to gain at least as many. Of course these changes in team success are largely driven by factors outside of the performance of their respective signature stars, but c'est la vie. I believed it before the season, and I believe it at the midway point -- The Greek Freak takes home the hardware.